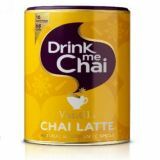 Large 1kg tub of Vanilla Drink Me Chai instant chai mix. A fragrant blend of sweetened tea, milk and creamy vanilla. 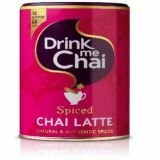 Just add water or milk for a deliciously spiced drink. 1kg tub with resealable lid. 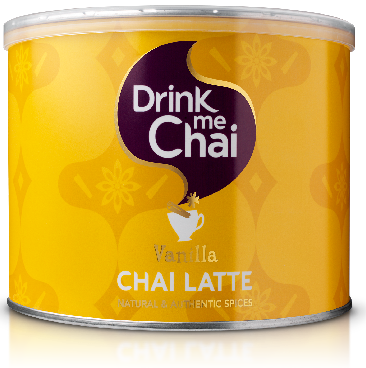 For 12oz cup Vanilla Chai Latte: Put 1 scoop of powder into a cup. Mix with a little hot water to make a paste and stir well. Add steamed milk. 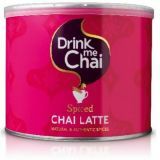 Eat Me: Mix 1 tablespoon of chai powder into 2 tablespoons of buttercream icing for an interestingly delicious cupcake topping.